If you’re searching for the best available fares, there are a few tricks and tools that will help you find what’s out there quickly and easily. –>Click on the images to enlarge, refer to the red boxed highlights. 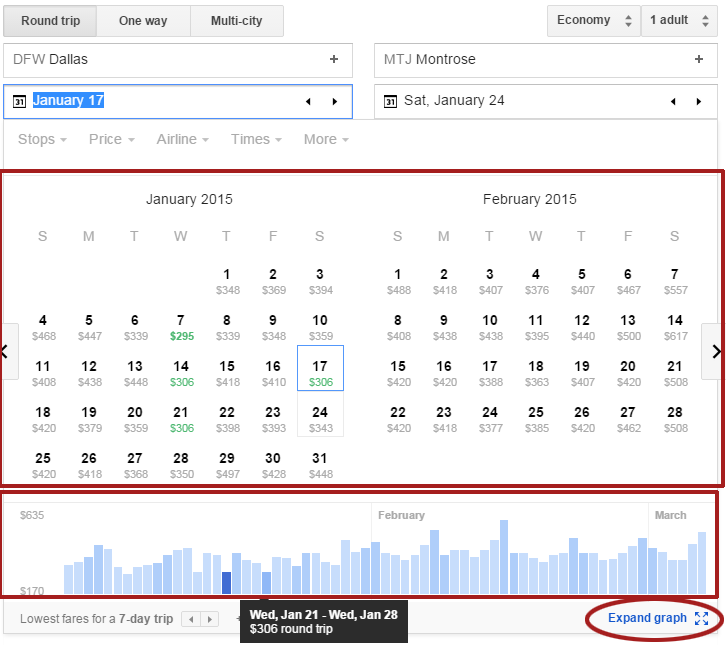 In your initial search on the homepage, a grid will automatically come up showing best fares through the month. 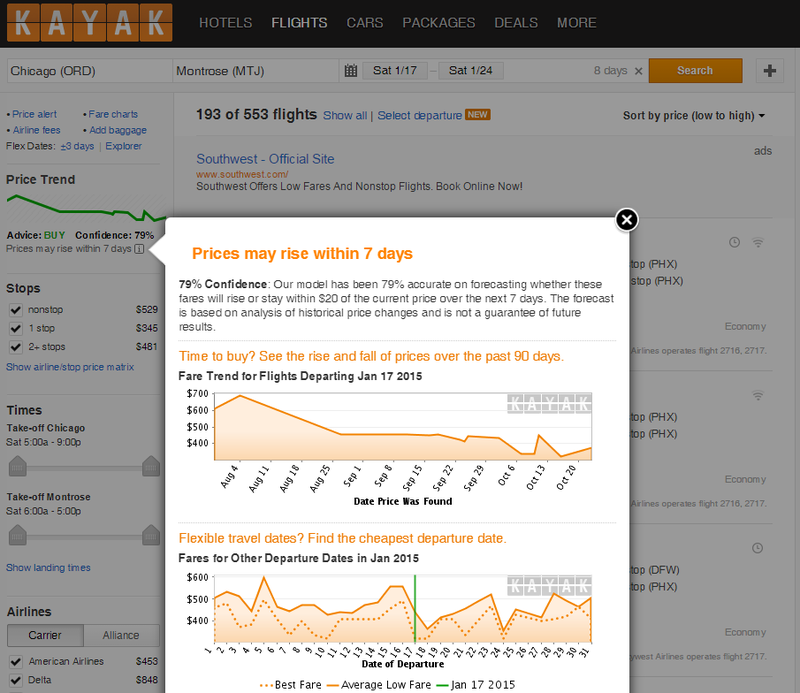 They also have a great graph across the bottom that you can slide your mouse over to scroll through the best fares. On the lower right, you can click to expand the graph to more easily scroll the prices. If the grid and graph doesn’t come up, or you’re further into the search, you can click on the icon link at any time. A pricing grid will also appear on the initial search page, and there are some great options once you’re into the search. In the upper left column, you can click on +/-3Day to expand to a pricing graph, and you can also click on Fare Charts or Price Trend to get the current trend, pricing forecast, and advice whether to buy now or wait. 1. Travel Off-Peak. Whether that is on a Wednesday to Wednesday schedule, or in early February rather than mid-March, you will find better fares on less-busy travel days and weeks of the year. 2. Be Flexible. 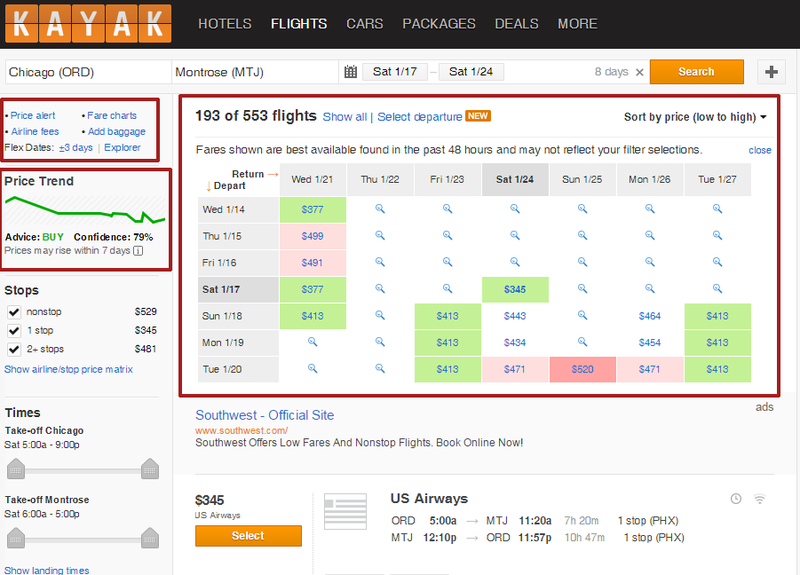 If you can adjust your travel within a 3-day timeframe, many times you can find a better fare – e.g. come out on the Friday rather than the Saturday. 3. Book Ahead. Airlines target business travelers for their short booking windows – and charge corresponding high prices. Make sure to book at least 7 days ahead, and many times 14 or 21 day advance purchases will mean extra savings.